12/68 Michael Bentley It'll infuriate you, it's sad at times, and at it's best you'll feel very guilty. 43/200 Max Braden Who doesn't want to buy an EV-1 after seeing this documentary? 48/159 David Mumpower This documentary will turn your stomach, but there isn't anything in it you didn't already get from 60 Minutes. If you haven't heard of the GM EV1, there's a reason. Despite the fact that this vehicle was one of the fastest, most fuel-efficient production vehicles ever made, General Motors simply crushed the fleet of these cars that were already made. 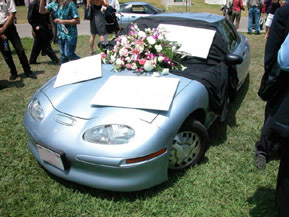 The EV1 ran completely on electricity and had zero emissions. The technology in the creation of the vehicle catapulted the U.S. to the forefront in the development of vehicles that would co-exist well in a future where the environment would be threatened by the stuff spewing from gas operated vehicles, and it also would be a solution to an ever-depleting oil supply. Smog control was the impetus for the creation of the EV1. In 1990, as California found itself in the midst of a pollution crisis, a Zero Emission Mandate was issued. That edict stated that 2% of all vehicles sold in California would have to be emission-free by 1998. The number was to rise to 10% in 2003. GM had an edge in the industry, as they already had a speed record-breaking concept car that could easily lend itself to the technology. The EV1 needed no gas. It required no oil changes, ever. It only rarely needed brake maintenance. In fact, the typical visit to have the car looked at would involve changing the washer fluid and perhaps a tire rotation. Vital statistics for Who Killed the Electric Car? Awards Awards page for Who Killed the Electric Car?